Not all that entertaining, and very low budget, but flashes of Miike's wacky brilliance make this worth seeing for fans of his work. 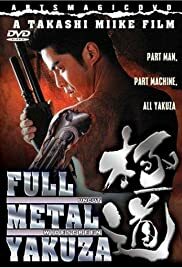 A wanna-be yakuza loser bumbles his way through the lower echelon unpleasantness of a gang, before a very unpleasant incident results in his being transformed into a deadly (if goofy-looking) cyborg fighting machine. Will he get revenge or will he just mope around like some whiner from a French movie and short-circuit in the rain? People familiar with Ichi will see a lot of the same elements (though Ichi does come from different source material). The protagonist of FMG is a proto-Ichi in many ways, full of angst and completely dysfunctional, stalking around in a plated body-suit and not much of a hero. Any serious pathos or plot development is undercut by the wacky joke bits Miike throws in (like our hero learning stances to deflect bullets). The silliness is definitely fun, but the movie is so schizophrenic that most of the enjoyment is of the "Whoa! Did that just happen?" variety. Dig in if you're a Miike fan, otherwise don't start here.